Walking is one of the easiest ways to exercise. You can do it almost anywhere—including parks, shopping malls, or in your own neighborhood—and you don’t need to invest in a lot of special equipment. 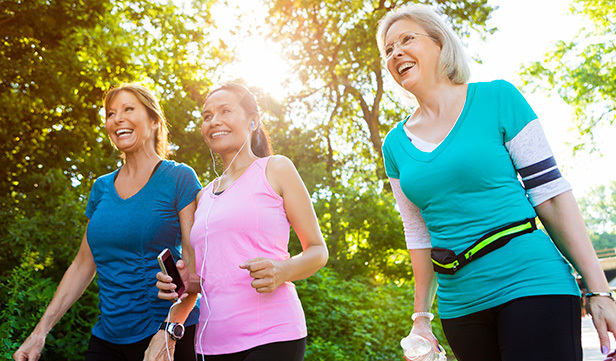 Best of all, walking can help you achieve your fitness and weight-loss goals. Before you begin any exercise program, see your doctor, especially if you haven’t exercised for a while or have prior injuries. Ask your doctor for tips on stretching and getting the most out of your fitness routine. Regular physical activity is good for you. It can help you achieve a healthy weight, tone your muscles, and increase both your energy and stamina. And, it’s a great way to reduce stress. It’s easy to start a regular walking program. All you need are a good pair of walking or running shoes and some comfortable clothes. Keep in mind that walking will elevate your body temperature, so dress in layers. Wear athletic socks instead of cotton since cotton retains moisture and can cause blisters. Begin with short distances. If it’s been awhile since you’ve gone for a long walk, start with a short stroll and gradually increase your time or distance each week. Walk at a pace that feels comfortable. If you’re walking with a buddy, you should be able to have a conversation without struggling to breathe. This isn’t a race. Drink plenty of water before, during, and after your walk. Listening to music or a podcast while you walk can be energizing, but if you wear headphones, turn the volume down. Walking is a great way to spend time with a friend. Try planning routes that allow you to explore new places together. The American Heart Association recommends that adults get 150 minutes or more of moderate physical activity each week. If it’s easier, take three 10-minute walks instead of one long walk. Even short 10-minute brisk walks will count toward reaching this goal. If watching your numbers add up over time motivates you, wear a fitness tracker or log your walks into an exercise app. If you experience pain when walking, stop immediately. Your doctor may recommend special stretches or better shoes. The best exercise for you is the one you’ll stick with over the long haul. The great thing about walking is that it’s easy to fit a walk into your schedule even when you’re busy. If you have 10 minutes, you have time for a walk.